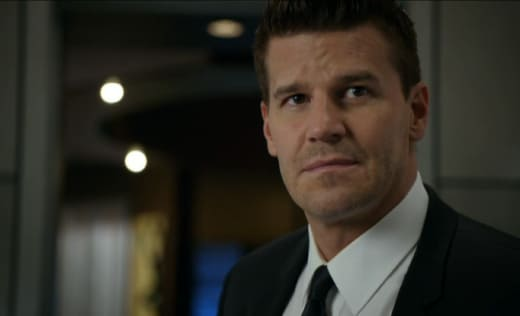 Bones and Booth investigated the death of a divorce lawyer this week. What a coincidence. In the hands of lesser writers or actors, the obvious parallels between the murder investigation central to "The Partners in the Divorce" and the couple's personal turmoil would've quickly grown tiresome. Thanks to the perennially terrific Emily Deschanel and David Boreanaz, though, it was anything but. 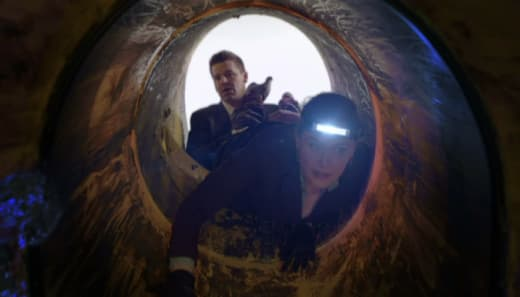 Bones certainly hasn't shied away from challenging its two stars since the end of Season 6, has it? Ever since Brennan got pregnant, it's been a turbulent ride for its two leads, and for the fans who adore them. Their relationship has been in overdrive since, and while the changing circumstances and obstacles altered things more than some would like, B&B haven't lost the spark that make them arguably TV's most dynamic duo. With Brennan back home safe and sound after last Monday's season premiere, tonight's episode was self-contained in terms of the case's procedural elements, but anything but from a relationship standpoint. Awkwardness. Their initial attempts to kiss one another in the kitchen were nothing if not cringe-worthy, as were numerous other exchanges where lingering resentment manifested itself in ways they didn't understand (or at least didn't communicate). It takes a strong pair of actors to sell such nuance with dialogue or without. Sadness. Hearing that she's glad they're not married and that perhaps she was more suited to life on her own - even on the run from the law - was a real stomach punch. Does she wish she were still out there? The disconnect runs far deeper than bickering over who makes breakfast or whether they go to the carousel. Hilariousness. Booth's disbelief at Brennan's recounting of her various fugitive exploits was priceless, but his tirade punctuated by yelling "ANGRY FBI!" to the foreman at the construction site took the cake. A close second? Her likening an estranged couple's reconciliation to time travel, which is also "theoretically" possible. Getting back on the same page emotionally isn't like flipping a switch, especially for people as inherently different as B-squared. As Angela said, three months changes a person ... even if a person isn't using an alias and a blonde wig, sleeping under a bridge and working as a fry cook in middle-of-nowhere Pennsylvania. Don't worry, Booth, I can't picture that either. This was, in a sense, the real Season 8 premiere, with Pelant gone (for now) and order restored at the Jeffersonian. Well, mostly. 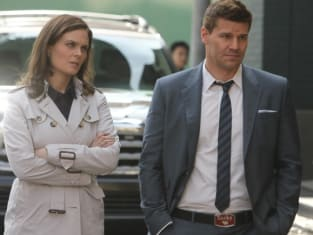 The tension between Booth and Brennan dominated the episode, however, so we're still a ways from any sort of equilibrium. How long will this go on? Will things start to settle down next week? Brennan is, at her core, a fiercely-independent person whose trust issues are shaped by fear of abandonment and betrayal. Spending months on the run will only exacerbate these things, and as such, her behavior this week, while often over the top, was very much in character. The question is: How long will it continue? More importantly, will Sweets pack heat for a third consecutive episode, will we see Hodgins' and Angela's baby again and what squintern will be front and center? Burning questions to tide us over until next Monday. What did you think of tonight's Bones? Comment below!